Hibernian manager Alan Stubbs says he expects his team to beat Rangers when the clubs go head to head at Easter Road on Sunday. Stubbs says he treats every game as a "must win" fixture and Sunday's game is no different, with the Leith men trailing the league leaders by eight points in the Championship. "That is the biggest compliment I can pay my players. I believe in them 100%." He added: "I have a really talented group of players, one that we have been building and getting stronger since the day I came in." 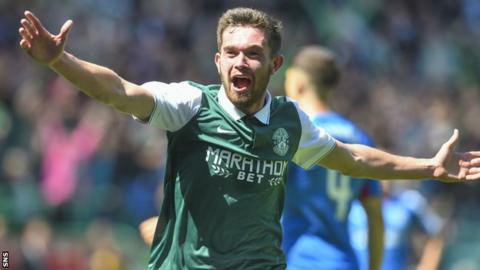 The last time the Ibrox club were at Easter Road was in July when they hammered six goals past Hibernian in the Petrofac Training Cup. Stubbs insists though there were mitigating circumstances that led to the defeat. "I would put a line through the Petrofac game," said Stubbs. "We were in probably a place where we were hit massively with injuries. I managed to get a team on the pitch but our bench was full of young lads." With eleven games played in the Championship, Hibernian could fall 11 points behind Mark Warburton's men should they lose on Sunday, but the Hibernian boss does not buy into the fact that the title race is over if Rangers leave with the points. "I treat every game as a must win game to be honest. There is no point thinking anything differently," he said. Earlier in the season there was a war of words between Stubbs and his Rangers counterpart Mark Warburton over the future of the then Hibernian player Scott Allan, who eventually left to join Celtic. Stubbs says as far as he is concerned the matter is closed and there is now no friction between him and the Rangers boss. He said: "Not from my point of view. At the time Scott was our player and we behaved in the right way. So from that point of view the club can look at itself and say they handled the situation really well. "From my point of view there is no friction. I respect Mark and he has done a great job up until now."